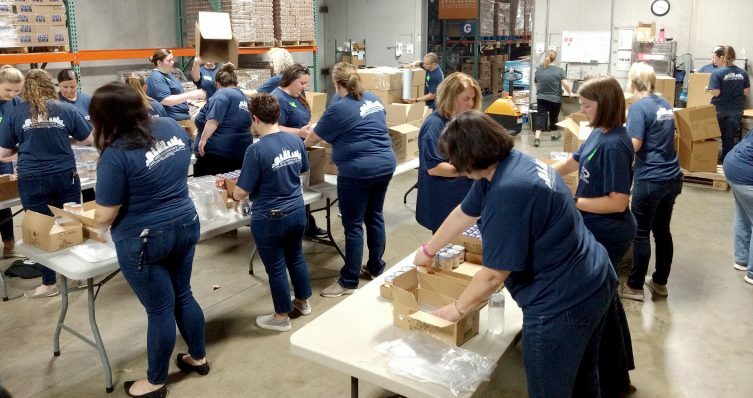 Several dozen volunteers from KraftCPAs worked with Second Harvest Food Bank of Middle Tennessee on Sept. 21 to help sort food and fill backpacks as part of the group’s Hunger Action Month. In all, more than 60 team members from Kraft divided into three groups to sort dry goods and frozen food and to fill backpacks. According to Second Harvest, the three teams sorted 11,049 lbs. of dry goods (or 9,208 meals), sorted 9,352 lbs. of frozen food (7,771 meals), and filled 2,450 backpacks with food. The project was part of a year-long commemoration of KraftCPAs’ 60th anniversary. Previous community service projects have included Habitat Build Day with Habitat for Humanity, as well as additional projects with Second Harvest. Second Harvest Food Bank of Middle Tennessee opened in 1978 to provide a central distribution center for companies, groups and individuals who wished to help provide food for hungry people in Middle Tennessee. Its mission is to feed hungry people and work to solve hunger issues in a 46-county service area.